Materialism is the idea that human consciousness is not causally efficacious in human life. This means that all that really matters for people (and about people) is their physical circumstances, not their mental aspects, such as their motivations, goals, values, virtues and vices. At most, human consciousness and ideas are by-products of environmental and/or genetic factors, with no substantive impact of their own. When someone looks at society and sees the most fundamental and important divide as that between the rich and the poor, that person is displaying materialism: He is classifying people first and foremost based on their material circumstances: how much money or wealth they have. It’s typical of leftists to think that it’s in the interests of the poor to advocate for welfare, Medicaid, and other government programs that will get them more money at the expense of wealthier taxpayers. Thus, such leftists are equating people’s interests with having more money. No apparent thought is given to the means by which the money is acquired, or the effects that wealth redistribution has on people’s mental condition–their motivation, ambition, self-esteem, moral outlook–when their demands for it are granted. In fact, even the advocacy of welfare payments based solely on income, displays a materialistic premise: The only thing that counts in whether someone “deserves” welfare is their level of material wealth. There is no consideration given to their moral character, values, goals, or motivations. There is no consideration of why they became poor: Was it because they were struck by one or two truly unpredictable personal disasters outside their control? Or was it because they made predictably poor choices out of carelessness, or because they were chronically irresponsible, mentally lazy people acting on any emotion of the moment? When leftists complain about “inequality,” it is almost always inequality of wealth to which they are referring. Again, this is a materialistic concern with how much money people have at the expense of other concerns that might be termed “inequality.” The sort of “equality” the Left pushes for flies in the face of what the US Founding Fathers meant by “equality”: not “equality of outcomes,” nor “equality of opportunity,” but equality of individual rights. It is equality of individual rights–the equal right to pursue life, liberty, property and happiness–that enables people to provide for both their physical and mental needs. It is a type of equality that lets individuals judge for themselves what they want to pursue, rather than having the Left’s obsession with material equality forced on them through government. The Left’s primary concern with material wealth and the opposition between rich and poor bears the imprint of Karl Marx. Marx was an avowed materialist, whose theory of human nature and history treats economic class struggles as the central concern of human life. Marx saw the world and human history in terms of economic classes. In capitalism, he posited two major classes: the bourgeoisie and the proletariat. The bourgeoisie are the people who own property, especially the “means of production” such as land, factories, and machinery. The proletariat are the people who do not own property, but instead make their living by selling their labor to the bourgeoisie: they are the workers in the factories and industrial farms. Marx treats each of these classes as a basic unit of human society, and he thought that this capitalist class system had inherent conflicts that would arise. These class conflicts would inevitably lead to the downfall of capitalism and bring about a violent proletarian revolution. (1) This revolution would first result in a “dictatorship of the proletariat”: a system of government in which the proletariat would have complete control of the state through a sort of direct democracy among them. The proletarian government would expropriate all the property of the bourgeoisie, and complete the transition to “collective ownership.” The state would then wither away, ushering in communism: a stateless utopia where people live in a perpetual “superabundance” of goods and services, and can do whatever they wish with their time and not have to worry about the production of necessities. Marx’s materialistic, class-warfare outlook has been transmitted down to the modern Left by a plethora of neo-Marxian intellectuals and activists, such as Max Weber, Saul Alinsky, Howard Zinn and Noam Chomsky. So, instead of talking about the bourgeoisie and the proletariat classes, most leftists today talk about the conflict between “the rich” and “the poor,” and/or “working class,” and/or “middle class” (the non-rich.) They still share Marx’s basic perspective that the central concern of society is the conflict between economic “classes,” but now it is between the “1 percent” with the highest income and the “99 percent” with lower incomes. In an individual’s life, it is his own mind–his judgment and choices–that makes the biggest impact on his life and happiness as a whole. (2) No other mind can be focused on one individual’s well-being throughout his life, like his own. Similarly, no other individual’s bad decisions can so thoroughly destroy his life and happiness like his own. Virtually every major issue in life, from choice of career, to choice of friends, to choice of lovers, to the choice to have children, to whether to be ambitious and set goals or lazy and irresponsible, to whether or not to engage in criminal activities, is in the hands of the individual himself. An individual’s choices, ideas and moral character shape his life in innumerable ways, and can lead to happiness or great suffering. In a society, individuals may get together, collaborate, and achieve great things this way. But each individual in a collaboration must be thinking for himself in order to contribute and benefit in the long term. For a productive and reliable collaboration, each individual must have the personal judgment to evaluate the ideas being put forward, then counter them or build on them. 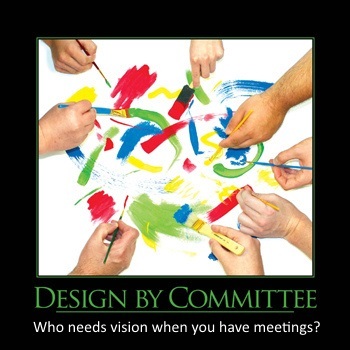 Without this individual judgment, collaborations produce “groupthink” and “design by committee.” An individual will benefit greatly and can avoid great harm if he has the personal judgment to end his own involvement in the collaboration when it is counterproductive. “The mind is an attribute of the individual. There is no such thing as a collective brain. There is no such thing as a collective thought. An agreement reached by a group of men is only a compromise or an average drawn upon many individual thoughts. It is a secondary consequence. The primary act—the process of reason—must be performed by each man alone. We can divide a meal among many men. We cannot digest it in a collective stomach. No man can use his lungs to breathe for another man. No man can use his brain to think for another. All the functions of body and spirit are private. They cannot be shared or transferred. In their quasi-Marxist, “rich vs. middle-class and poor” mode, leftists deny the individuality of the human mind by lumping people into economic classes and assuming that people’s interests will be determined by their placement in those material classes. They assume that the rich will have a common interest in lobbying or bribing the government for special favors and bailouts, while the poor and middle-class will have a common interest in campaigning for welfare programs and wealth redistribution. But this view flies in the face of facts. Many wealthy people, such as Warren Buffet, Ted Turner, and Michael Moore are leftists who call for higher taxes for the wealthy and/or more tax relief or welfare for the poor. Indeed, polls show that the top 1% of income earners is not radically different in political leanings from the bottom 99%. Similarly, many poor and middle-class rural people lean conservative and want to reduce welfare and other wealth redistribution. Furthermore, in capitalism or even today’s mixed economy, individuals transition between “the middle-class” and “the rich” all the time, (and sometimes back again) depending on individual choices and circumstances. This defies the original meaning of “class” as used in feudal societies: A class was a socially/governmentally recognized position into which one was born and remained for life, regardless of one’s actions. “Real” classes were sets of individuals that were accorded different levels of rights by the government, whereas laissez-faire capitalism accords all individuals equal rights. So it really makes no sense at all to speak of classes in laissez-faire capitalism. From “Rich vs. Poor,” to “Society as a Whole”? The most famous leftist appeal to this latter idea is that of President Obama in 2012. He echoed many, many leftists before him when he said, “If you’ve been successful, you didn’t get there on your own….If you were successful, somebody along the line gave you some help….Somebody invested in roads and bridges. If you’ve got a business, you didn’t build that.” This leftist line of speech is meant to insinuate some materialistic, collective responsibility for every individual’s success. It sets up a straw man of individual responsibility, in which individual responsibility for your success means operating in a complete vacuum, with no other individuals to help you, provide knowledge, or trade with you. In contrast to this straw man, leftists point out the obvious fact that there are other people that raise an individual, teach him, and trade with him. But this merely distracts from the actual question of Rand’s individualism versus leftists’ materialistic collectivism: Do individuals need to exert their own effort and think to achieve success and contribute to human progress, or can a collection of mindless zombie-humans fuse together into a collective entity that will generate wealth, technology and progress? Was, for example, the iPhone a “collective product of society?” Was Steve Jobs just a figurehead for the collective mass of American society that produced the original iPhone? Well, consider a hypothetical woman in 2007 who was a 20-year-old single mother-of-two, who worked a minimum wage McDonald’s job in Raleigh, NC. She had received more in government welfare and benefits than she had ever paid in taxes. How did she contribute to the development of the iPhone? She did not, and no one could reasonably say that she did. She was not doing part of the job of Steve Jobs, nor helping him in any other way. Yet the leftist line of speech relies on her “contribution,” as part of the “collective society that built the iPhone,” to justify robbing Steve Jobs of credit for his very real contribution to the iPhone, as well as some of his personal compensation for that contribution. “Society” did not teach Steve Jobs in school; certain individuals did, and they were compensated at the time. “Society” did not feed Steve Jobs; certain sets of individuals involved in the stores, restaurants and their food suppliers that Jobs chose to patronize, did. They were compensated at the time of purchase. “Society” didn’t build the roads and bridges that Jobs drove on; contractors, who were paid by local/State/Federal governments did. To pay for the roads and bridges, the government forcibly extorted tax money from individuals who had earned it by producing wealth. On a per-person basis, more of this money came from rich and highly successful individuals like Steve Jobs, than your average citizen. It was the individual choices and judgment of the people actually involved in the development and production of the iPhone that made the difference between the world seeing the iPhone, and just continuing along in its absence. Thus, each of them deserves compensation in proportion to his individual involvement. It is a definite set of one or more individual minds that contributes to any step of progress in wealth or technology, not “the middle-class,” not “the proletariat,” and not “society as a whole.” Ayn Rand recognized this, while leftists generally don’t. (2) Here I assume the context of a moderately to very free society. Totalitarian governments and primitive societies in the midst of tribal warfare can stifle human survival and put an individual’s happiness out of reach. This entry was posted in Human Nature, Politics and tagged Ayn Rand, barack obama, freedom, government, Karl Marx, obama, Objectivism, philosophy, socialism by Sword of Apollo. Bookmark the permalink.